Description: Sandia National Laboratories is operated and managed by Sandia Corporation, a wholly owned subsidiary of Lockheed Martin Corporation. Sandia Corporation operates Sandia National Laboratories as a contractor for the U.S. Department of Energy’s National Nuclear Security Administration (NNSA) and supports numerous federal, state, and local government agencies, companies, and organizations. As a Federally Funded Research and Development Center (FFRDC), Sandia may perform work for industry responding to certain types of federal government solicitations. The solicitation must allow FFRDC participation and meet the requirements of Sandia’s management and operating contract with DOE/NNSA. A strong science, technology, and engineering foundation enables Sandia’s mission through a capable research staff working at the forefront of innovation, collaborative research with universities and companies, and discretionary research projects with significant potential impact. Through science and technology, people, infrastructure, and partnerships, Sandia’s mission is to meet national needs in six areas: Nuclear Weapons; Nonproliferation; Homeland Security and Defense; Energy, Climate and Infrastructure Securit; Defense Systems and Assessments; Science, Technology, and Engineering. Description: The DETL provides a highly configurable distributed systems evaluation platform for characterizing distributed resources and controllers, including inverters, other power electronics equipment, and programmable loads. Specialized equipment and capabilities allow for evaluation of grid interaction, operational efficiency, interoperability, safety and reliability under a wide range of conditions, including irradiance variability, array mismatch, temperature, power level, voltage and frequency, grid-connected and microgrid configurations and transitions. The laboratory reaches a power range of 150kW for PV up to 600Vdc, 240kW for simulated PV up to 1000Vdc, 180kVA for the grid simulator, 225kW for the diesel genset and 1MW for the Energy Storage Test Pad. The facility is in operation since 1982 and is managed by five constant employees. For the future, an extension including a cyber-grid test platform is planned. Description: 150 kW of PV available as a configurable DC source; 30 kW Capstone Microturbine; 225 kW diesel generator; 600 kWh battery bank. Description: 15 PV inverters ranging from 3 kW to 100 kW. Description: Two PV simulators (40 kW and 200 kW) with hardware in the loop capability, allowing up to 20 separate inverters to interact with distinct or identical DC sources of different module technologies. Description: 180 kVA AC simulator allowing grid variations in frequency and voltage. Description: Extensive control infrastructure for automated tests, data acquisition and analysis. Description: Avtron reactive load bank (Avtron K595, K589, K596). Description: Integration into Sandia’s Energy Storage Test Pad, with capacity for electrical, control characterization of large storage systems and power conditioning units up 1 MVA. Description: Communications infrastructure to assess smart-grid commands using several protocols, such as DNP3, Modbus and SEP. Description: Dynamometers for motor testing (single phase and 3 phase). Cybersecurity testing capabilities including Kali linux penetration testing platform, reconfigurable networking, emulated networking capabilities, Virtual machine capabilities. Inverter tests for anti-islanding (autonomous methods and communication methods (PLCC, synchrophasor), voltage and frequency ride-throughs, and other safety and performance tests. Inverter experimentation for advanced grid-support functions (e.g., volt-var, frequency-watt, etc.) and inverter interoperability experiments using the SunSpec System Validation Platform. Energy Storage Performance and Interoperability. DER reliability experiments with a thermal chamber. PV system protection experiments, e.g., arc and ground fault experiments. SCADA Technologies: DETL has a Wonderware SCADA system and communicates to DERs and meters around the laboratory. 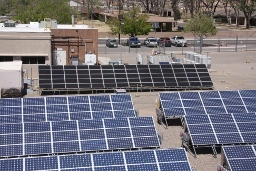 A full list of SANDIA PV publications can be accessed here. IEEE PVSC, Portland, OR, 5-10 June, 2016. IEEE Applied Power Electronics Conference (APEC), Long Beach, CA, March 20-24, 2016. IEEE Transactions on Sustainable Energy, vol. 7, no. 1, pp. 390-399, Jan. 2016. Applied Power Electronics Conference and Exposition, APEC 2016. Thirty-first Annual IEEE; Long Beach, CA; 20-24 March 2016. Power and Energy Society General Meeting (PESGM2016), Proceedings of the, Boston, MA, USA; July 17-21, 2016.
International Symposium on Power Electronics, Electrical Drives, Automation and Motion (SPEEDAM), June 22-24th, 2016, Capri, Italy. 43rd IEEE Photovoltaics Specialists Conference (PVSC2016); Portland, OR. ; June 5-10, 2016.